Here’s a round up of some of the beery things I’ve been up to or attended lately but been far too busy with paying gigs to write about… NB: Link to Doug Odell audio interviews now added – see below! Celebrating the International Brewing Awards at Mark’s Bar downstairs from HIX, Soho Last month winning brewers from around the globe gathered at London’s Guildhall for the prize-giving ceremony of the International Brewing Awards (aka the Beer Oscars) – which is the oldest brewing competition in the world. Cider was included in the awards for the first time in around 60 years and winning breweries included Sierra Nevada, Camden Town, Elgood’s, Thwaites and Sharp’s. I was lucky enough to be invited to a beer and food matched dinner at Mark’s Bar in Soho to celebrate the awards. The evening was hosted by renowned Australian brewer and Beer Sommelier Bill Taylor – also Chairman of Judges for the Awards – and he came up with some stunning pairings although he modestly described the evening as a conversation between beer and food rather than a beer and food matched event. One of my highlights of the evening was a pre-dinner beer in the shape of Mac’s Sassy Red best bitter – although to my palate it was about as far from a pint of best as you can get. Rather it was a deliciously dry, spicy beer full of red berry flavours and just a subtle hint of sweetness. If it was the only beer I’d been allowed to drink all evening I’d still have been a very happy woman and at just 4.5% I probably could have got away with it too. The beer is ‘liberally hopped’ with Motueka – a hop that seems to keep turning up in brews that make me go “Oooh!”. The downside of discovering this beautiful beer is that it’s currently only available in New Zealand – where it is brewed. I am trying not to cry about this and instead waving maniacally at any beer wholesalers/importers/etc who are reading and think there is a way of getting a supply of this beer into the UK. But, I digress. 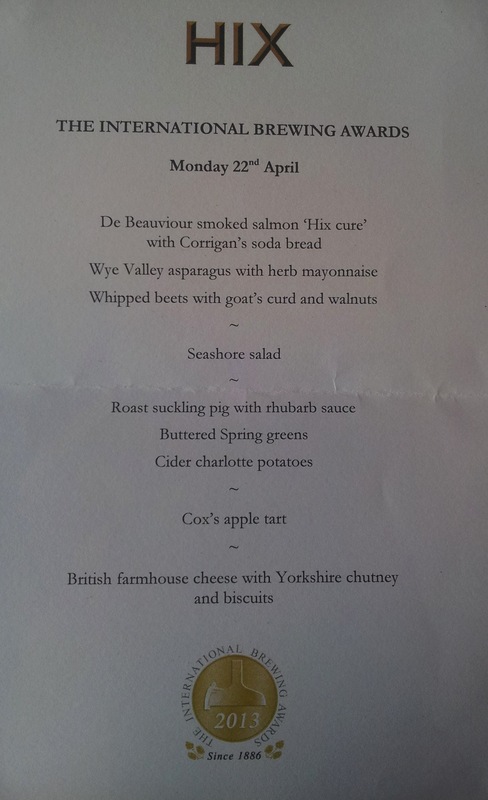 I won’t describe each course of the dinner, partly not to bore you and also – honestly – because it was one of those great evenings of good food, beer and people that meant I spent more time chatting and enjoying myself than writing things down. Which I think is a big accolade to Mark’s Bar and Bill Taylor for the show they put on. Instead here are a few ‘awards’ of my own. Biggest surprise of the evening: Tyskie Gronie lager is jolly tasty. Look out for this 5.5% Polish beer at your local supermarket. It is an incredibly drinkable, biscuitty brew with a light citrus flavour and a clean-tasting refreshing quality. I’m going to get some of this in if summer shows up as I think it will make a great drink for warm nights. Best food match of the evening: The roast suckling pig was just about the most delicious succulent, fall-apart, melt in the mouth pork I’ve ever had (second only to Pig & Porter’s pulled pork). It was served with rhubarb sauce which is about one hundred times better than apple sauce, but what took this little piggy up a further notch was matching it with Mort Subite Oude Kriek. I gleaned from Des de Moor’s useful review of the beer that its name means old cherry beer and the brand name translates as Sudden Death – but don’t let that put you off; nor Kriek’s reputation as that-really-sweet-cherryade-type-beer-that-‘experts’-always-try-to-get-you-to-drink-with-dark-chocolate. This Oude Kriek was tart, dry and fruity and very far from sweet. It tasted amazing with the suckling pig, working even better than the rhubarb sauce. Seek some out next time you are having roast pork for Sunday lunch. Dancing beer of the evening: As regular readers of this blog will know dancing beer is the term I invented for a brew the very sight or merest sip of which causes me to dance with glee. It could have been the Sassy Red. 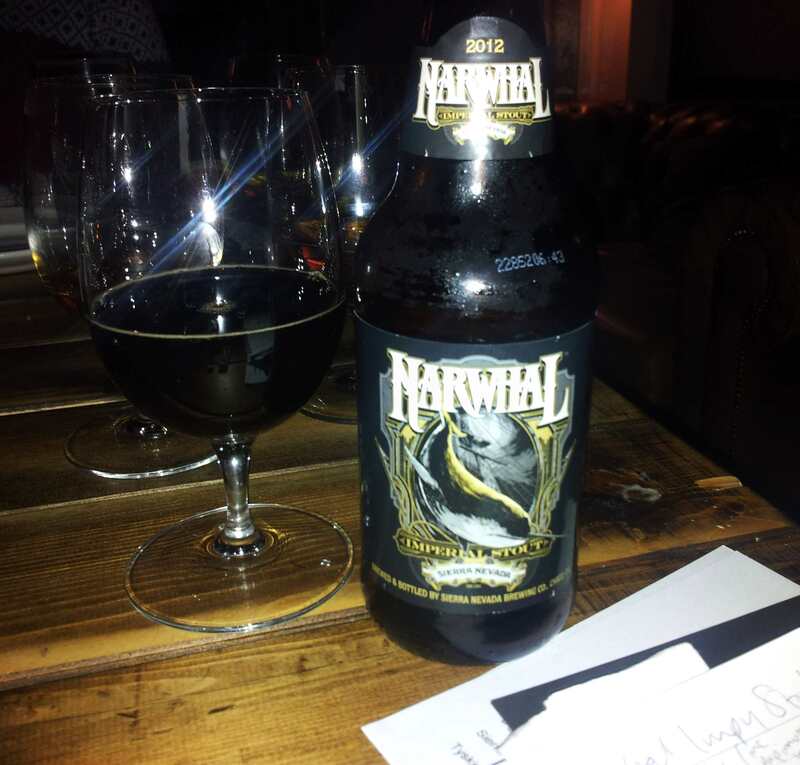 Until I tasted Sierra Nevada’s Narwhal imperial stout. At 10.2% it’s no surprise it comes with a big alcohol hit, but the mix of heady coffee and chocolate flavours with a hint of vine fruits is equally intoxicating. My verdict on the evening: It was a privilege to be invited to share some amazing beer and food in such good company. Chimay launches rare brew in UK thanks to Fuller’s Unveiled in the appropriate and rather atmospheric setting of the crypt beneath St Ethelreda’s Church near Holborn Circus in London, beer buffs gathered to find out what a partnership between Chimay and Fuller’s was going to bring. 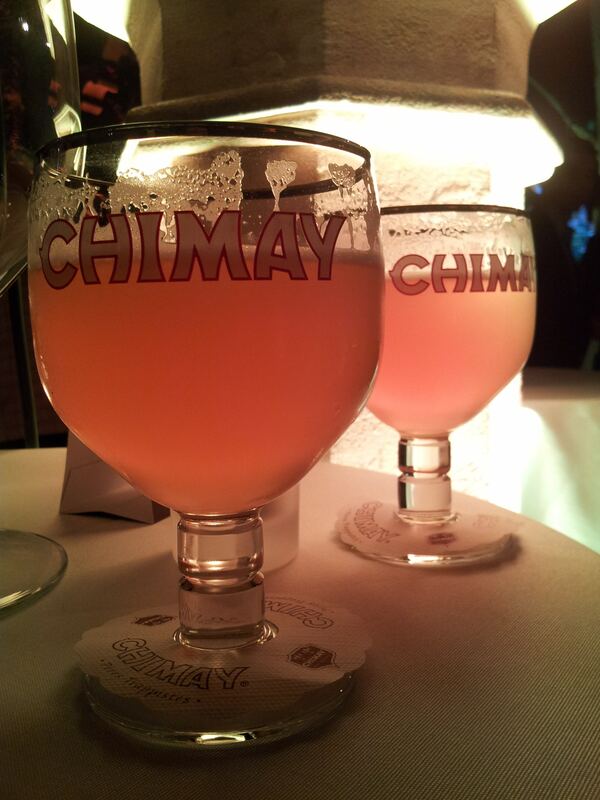 The answer: Chimay Gold, which is known in Belgium as Chimay Dorée (Dorée means Golden). At just 4.8% ABV it’s much lower in alcohol than most Trappist brews (which usually weigh in at well over the 6% mark) and is also notable because it was originally reserved only for members of the Abbey monastic community. More recently it has been made available to guests of the community and to staff members working for Chimay – but only at a handful of locations in Italy and also close to the monastery – so its release in the UK is a bit of a landmark moment. The beer itself is a burnished, shiny golden affair which at first sip was incredibly herbal and almost savoury – making me realise why the monastery has plans to make much more of beer and cheese matching in the near future (Their cheeses are delicious too; I believe we had the Chimay Grand Classique – a soft, tangy creamy cheese – and the Vieux Chimay, a stronger, mature cheese with a woody, nutty flavour – at the launch). The beer’s aftertaste is soft, but tart, with lactic vanilla notes. In bottle the beer tasted much less savoury/herbal and the vanilla elements of the flavour were much more prominent. Instead it showed off some smokiness along with clove-like flavours. Chimay Gold didn’t seem like a ‘me too’ beer to me but given the draught format it comes in is keg it might not attract old school cask ale drinkers in droves. That aside, whether you try it on draught or in bottle it is an essential for Belgian beer fans. Camden Town Brewery v Odell Brewing?! 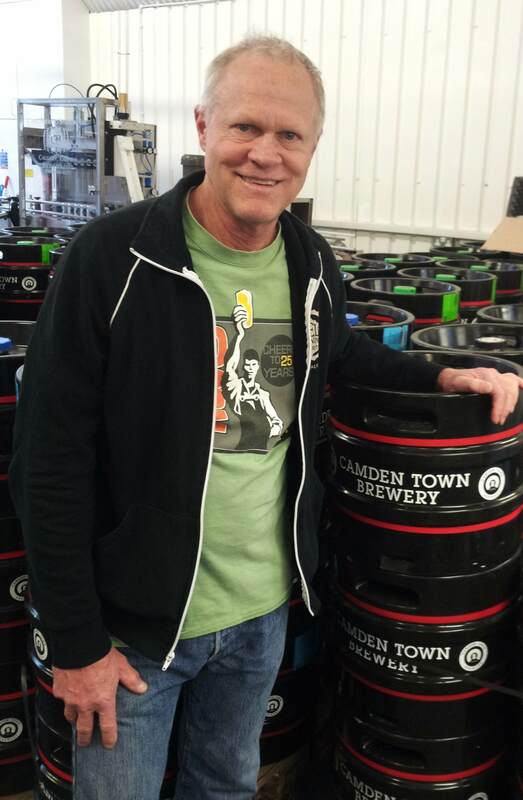 Although I’m not a huge fan of Camden Town’s beers – give or take their USA Hells – I was eager to attend their recent ‘drop in’ event in honour of the fact that Doug Odell had popped over from Fort Collins, near Denver, Colorado to make a beer with them. Odell make one of my favourite beers, which also enjoys the accolade of being one of the few US brews that Beer Husband is also keen on, Cutthroat Porter. This fairly low ABV dark beer (4.7%) punches well above its weight and manages to be both deeply, rich and refreshing at the same time. The beer the two breweries have come together to make is influenced by Cutthroat Porter and Camden’s standard Hells lager (standard as opposed to the aforementioned USA Hells) and is planned to be a 7% Baltic Porter/Black lager. I recorded an interview with Doug Odell while I was there – which I’ve posted on The Beertalkers Audio boo channel – in which he told me all about the beer and what went into it. I can’t wait to try it, but I’ll have to as it won’t be ready before the end of June. Harrumph! In the meantime, here’s a picture of Doug and his lovely smile! Next Farmers and the countryside make our beer!